The original product. Only for professionals. Diamond is a silicone , transparent, viscous gel. 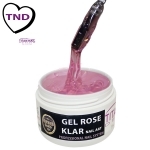 This gel is characterized by great flexibility. Ideal for strengthening natural nails .. It is designed specifically for natural nails. Super suitable for nails in both hands as well as in the feet. It has excellent adhesion to the natural nail . A thick gel with a high gloss designed to make filling fast and simple one step. Apply a layer of Diamond Crystal Series gel on the entire surface of the nail and cured for 2 minutes. Repeat for second layer, this time imposing higher layer Saphir Crystal Gel Series or Series Brilliant Crystal Gel to shape the natural nail - curve "c". Remove sticky layer with a cleaner and spiłuj nail to the desired shape . Place the final layer of Diamond Crystal Series Gel with light cure for 2 minutes. Remove sticky layer with the effect Gloss Cleaner and spiłuj edges to the desired shape . Just follow the instructions. All articles Naildesign are manufactured according to German standards ! This product was added to our catalog on Monday 08 June, 2009.